Intel is no longer satisfied just partnering with other companies to create self-driving cars: it wants to own the whole stack. Well, at least as far as the autonomous hardware and software go. The chip maker just announced it intends to purchase Jerusalem-based Mobileye for $15.3 billion. The two companies were already working together on various projects. The pair announced a partnership with BMW in July 2016 with the aim of putting an autonomous car on the streets by 2021. Then in November, the two companies partnered with auto parts maker Delphi to create the Automated Driving Group, which will create a self-driving car system that can be sold to automakers. Mobileye is best known for supplying car maker Tesla with hardware for its semi-autonomous system, Autopilot. That relationship ended last fall over a disagreement about Tesla’s development of Autopilot and the various controversies surrounding it, according to Bloomberg. Tesla has since partnered with Nvidia, which, like Intel, is developing computing hardware for cars. In September, Nvidia announced the Xavier supercomputer chip powered by the 512-core Volta GPU intended for use in self-driving cars. Prior to that, in January 2016, Nvidia announced the PX 2 water-cooled “supercomputer for cars,” which is used by Tesla. Intel, meanwhile, recently announced its Go computer for self-driving cars that can hold up to 28 Xeon chips. The story behind the story: Self-driving car technology appears to be the next frontier where Nvidia and Intel will face-off. The two companies are also rivals in the data center with Nvidia steadily making gains with its coprocessors, as well as artificial intelligence and deep learning applications. Interestingly, there may not be that much difference for Intel between self-driving cars and data centers. “As cars progress from assisted driving to fully autonomous, they are increasingly becoming data centers on wheels,” Intel said in a statement announcing the Mobileye deal. 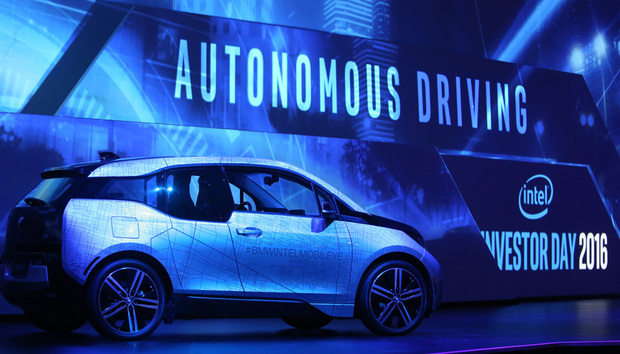 Intel expects self-driving cars will “generate 4,000 GB of data per day” by 2020.